Running for My Life is the story of a boy named Lopepe from South Sudan who has gone through more hardship than you can dream of, most of it as a child. 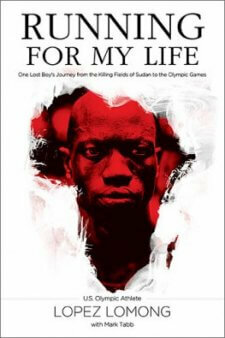 This book tells his extraordinary story of how he wound up running in the Olympics for the United States. When he was a child of five, Lopepe Lomong was abducted by rebel soldiers in South Sudan. Along with a group of all the other children in his church, he was taken to a rebel camp where he was kept for two weeks. His parents buried him in absentia, but Lopepe wasn’t dead as they thought. In the night, he escaped through a hole in the camp fence, and ran to the refugee camp of Kakuma, in Kenya. Once in Kakuma, Lopepe (now christened as Joseph) began to run, and honed his skills in soccer. As he grew up he became the leader of his tent of boys and looked after them. When he saw Olympic athlete Joe Johnson run in the 2000 Olympics, he decided that one day he would get out of Kakuma and go to the United States and one day be in the Olympics, so that he could bring his brothers from Kakuma to the United States also. Joseph’s dream came true when he was selected as one of a few boys to be taken to the United States, where his foster parents were waiting for him eagerly. Once there, his life would become more difficult than ever, as he adjusted to American culture and completed a high school education in two years. He also started running: running a lot. With the support of his adopted family, Lomong moved to a collage in Phoenix and began to train with the goal of going to the Olympics. In 2007, despite an injury, he qualified to run at Beijing. What I found most admirable about this story is that Lomong’s heart is for Africa. His running is great, but it’s backed up by a desire to help other boys in South Sudan, who are like he once was; a desire to make things better for people like his family, who remained in South Sudan. This is the sort of desire we need more of in our nation. The book is fairly well written, but it’s obviously not for the writing that you’d pick up this book. Writing aside, it tells a stirring story of hard work and determination and reliance on God. I recommend that you pick it up if you can and give it a read.